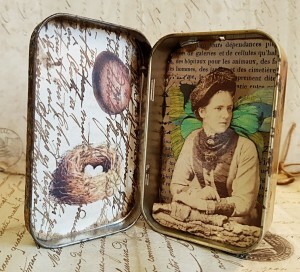 This altered Altoid Tin features a beautiful belle (with a mighty fetching hat). 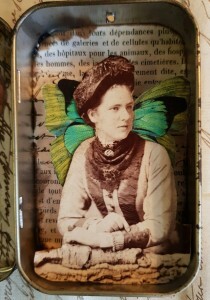 She is an original, clipped from a carte de visite circa 1880s. 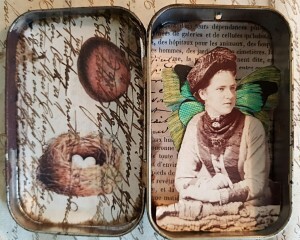 I have added some wings and she is offset in the middle of this drawer for a 3-d effect. On the other side are images of bird’s nest and egg over an original, handwritten document from 1902. 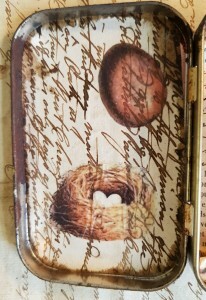 The front has been distressed with wood glue and blow torch, and I have embellished with another bird’s egg on tea bag. It measures 6cm x 10cm when closed. Cost is £25 or $35 usd. Shipping is £3 ($4.00) worldwide.